A restaurant's color isn't just an arbitrary choice. It should be chosen with thoughtful deliberation, as it is the foundation of the entire marketing and branding for the restaurant. It’s important to consider how you want your guests to feel while eating at your establishment. It's equally important to think about the kind of restaurant concept you are working with and the kind of ambiance you want to create for customers. When determining a restaurant's design, color is an important consideration, as it can influence the way people eat. Choosing the right colors for a new restaurant is especially important because they represent the restaurant's brand. Along with colors, selecting proper textures, lighting, and other elements can create an inviting atmosphere for customers. Warm colors including reds, yellows, and oranges have the most impact on increasing a person’s appetite. Red especially is noted for creating a rich and luxurious environment for diners and increasing impulse eating, such as ordering an appetizer and a glass of wine. But it’s important to keep in mind that not all shades of red, orange, or yellow are created equal. Muted earth tones are best for restaurants, such as terracotta orange, Tuscan yellow, and deep garnet red. You should avoid really bright, vibrant shades for your main color. Yellow, especially, can be very irritating if it is too bright or used too much throughout a dining room. Of course, if your goal is to have a high turn-over rate, such as a fast food establishment, using a brighter shade of any of these colors can subconsciously hurry along customers. Yellows and oranges can add cheer to a restaurant’s decor. These colors are perfect for a cafe, yogurt shop, or another type of lighthearted, inexpensive eatery. Warm shades of yellow or orange, such as squash or pumpkin, can add an inviting atmosphere to these establishments. Green is another popular color for restaurants. As with warm colors, muted earth tone shades of green are best. In a restaurant, green walls and accents denote health and nature and can convey the perception that its menu is healthier than its competitors. Green shades also indicate sustainability, a popular concept among organizations. Green pairs well with brown and orange for a fresh, light color scheme, perfect for a sandwich shop or vegetarian-based bakery. Conversely, green doesn't work well for meat-based restaurants, such as steakhouses, nor in dimly lit bars with patrons huddled around their beers, where the color can turn swampy. Colors that don’t work well for restaurants are blue and purple. 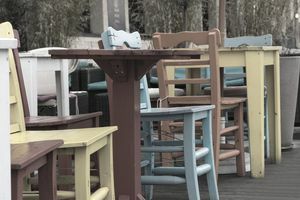 Actually, blue is the most liked color in the United States and promotes a calming atmosphere, but it does not translate well to most restaurant concepts. This is, in part, because there are not a lot of natural blue foods. Most blue foods are artificially dyed to appeal to children, such as ice pops, blue yogurt, and cotton candy. The same is true of purple. Blue and purple could serve as accent colors but should be used sparingly. Black, white, beige, gray, and brown are all excellent colors to incorporate into a restaurant’s decor. Black and dark brown, when used as an accent, denote sophistication, making them ideal for a fine dining restaurant. White denotes cleanliness and uniformity. When paired with a bright accent color, it is perfect for a quick service restaurant, such as Five Guys or White Castle, both of which use a predominantly white, sterile background with added pops of primary colors. Beige, gray, and brown are ideal for creating a warm environment that allows the food and service to stand out. Adding texture to your restaurant’s decor will help create a welcoming ambiance for customers. Soft gray walls paired with polished dark wood furniture and glass sconces, or earthy browns paired with copper metal tabletops and green velvet chairs, offer a relaxing, inviting atmosphere to diners. Water and fire are two other elements that can make a restaurant dining room unique and visually pleasing. Restaurant decor may include tranquility fountains, aquariums, and fireplaces, which add sound and movement to create a pleasant, distinct experience for customers. When selecting colors for a restaurant, consider its concept and customer experience. Your restaurant can offer customers a leisurely dinner with coffee and dessert or a place to stop for a quick bite. A white tiled restaurant interior provides a very different experience than a dimly lit terracotta interior. Another item to consider include the size of the dining room. Cool, light colors tend to expand small spaces, while warm colors help to create a feeling of intimacy in large spaces. Finally, be sure to select color combinations that are not too trendy and hip, which eventually can appear outdated. While there are exceptions to the rule about restaurant colors, knowing the basics can help your new restaurant establish a strong brand right from opening day. If you are unsure about which colors best represent your restaurant brand, it is worth the investment to work with an interior designer who specializes in restaurants. They can put together sample designs for you to choose, taking out all the guesswork. What Are Some Factors to Consider When Choosing a Restaurant Name?